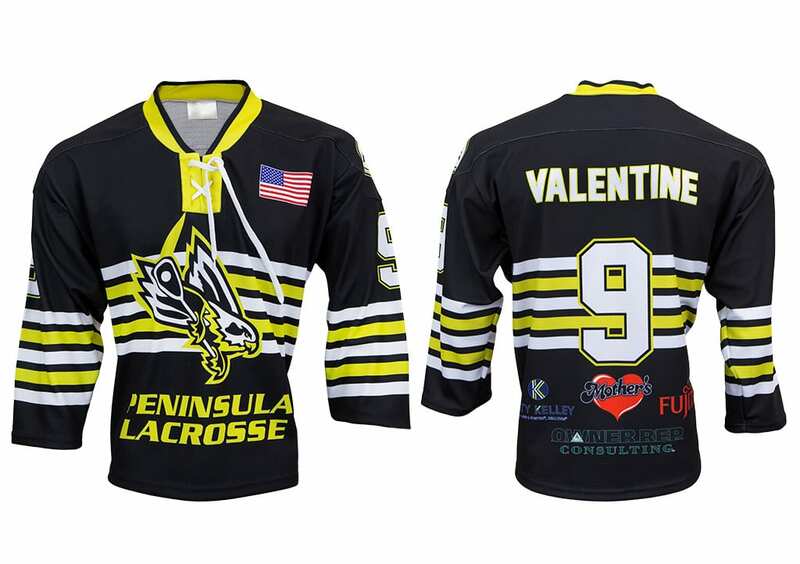 Lacrosse jerseys, Box lacrosse jerseys, Lacrosse EU | Bison Sportswear. Whether you play Field lacrosse, Box lacrosse, Intercrosse, or Czech Lacrosse, you can not do without the proper sport equipment, the team spirit and also becoming and mainly functional jersey. The jersey pattern is manufactured in two versions – the men’s (classical or raglan) and the women’s (classical or raglan anatomically adapted to the female body). You can also choose from new, attractive adjusted patterns. Naturally, you can choose the type of collar, fonts and numbers according to your wishes. The basic size can be determined using the size tables. The best materials of jerseys are: CANADA 155 gr., CoMo 160 gr., LION 160 gr., CUBE 145 gr., BÁRA 145 gr., GOLF 205 gr. and on-Zone 170 gr. More information about materials can be found here. Information on the price can be found in the price list. The jersey is manufactured in several pattern versions – Supre 6 and Supre 7. All patterns can be further adjusted. It is possible to carry out the adjustment in the form of double sleeves or shoulders, sewing ventilation and mini-ventilation mesh into the side part of the jersey and the like. We adjust color of the meses as one of the few manufacturers in order to achieve perfect resulting jersey design. Naturally, you can choose the type of collar, fonts and numbers according to your wishes. The basic jerseys size can be determined using size tables. The best materials of jerseys are: CANADA 155 gr., CoMo 160 gr., LION 160 gr., KOSTKA 145 gr., BÁRA 145 gr., GOLF 205 gr. and O-Zone 170 gr. More information about materials can be found here. Information on the price can be found in the price list. 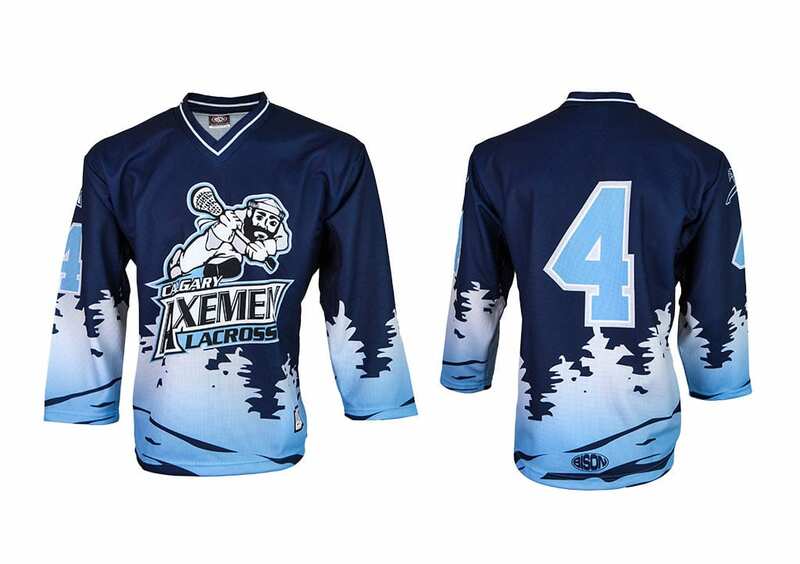 Jersey for Box Lacrosse is made in several patterns, namely Classic, Round Yoke, Raglan Yoke, Raglan, Raglan – Round Yoke. All patterns can be further adjusted. It is possible to carry out the adjustment in the form of double sleeves or shoulders, sewing ventilation and mini-ventilation mesh into the side part of the jersey and the like. We adjust color of the meshes as one of the few manufacturers in order to achieve perfect resulting jersey design. Naturally, you can choose the type of collar, fonts and numbers according to your wishes. 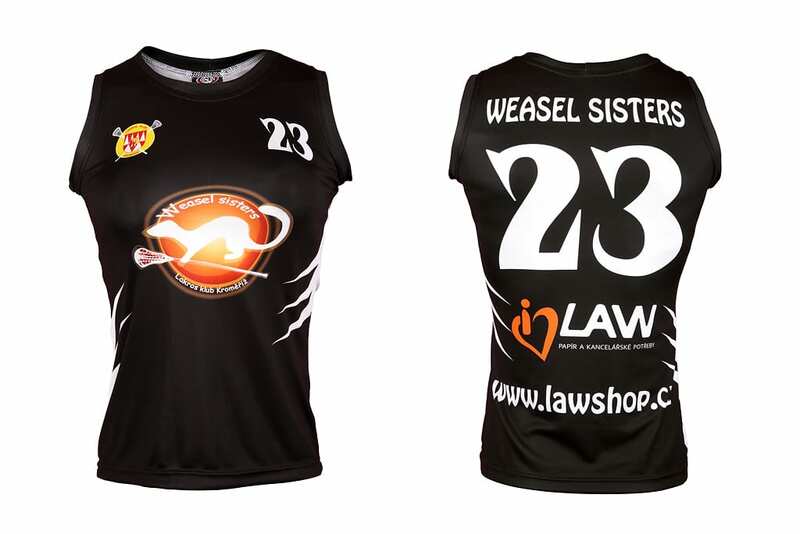 We also have an option to choose lower finish of the jersey in the STANDARD or PRO style. The basic size jerseys can be determined using the size tables. . The best materials of jerseys are: CANADA 155 gr., CoMo 160 gr., LION 160 gr., KOSTKA 145 gr., BÁRA 145 gr., GOLF 205 gr. and O-Zone 170 gr. More information about materials can be found here. Information on the price can be found in the price list. 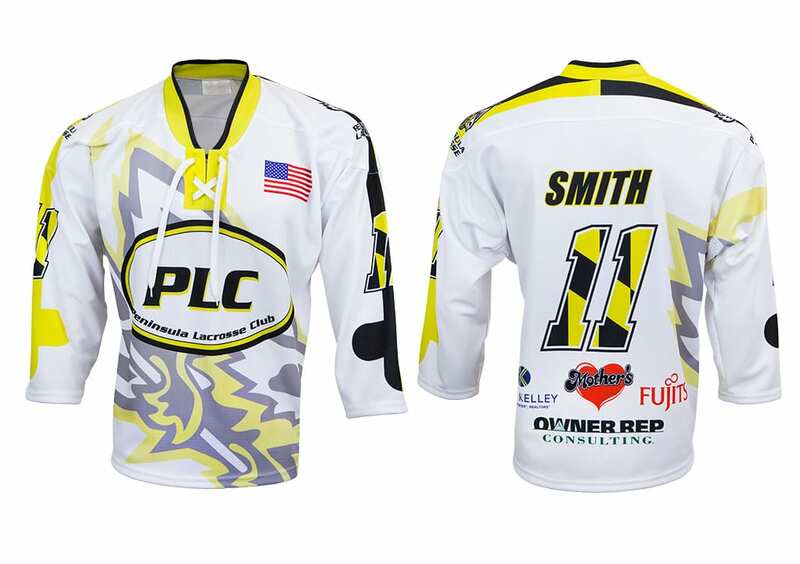 Jersey for Box Lacrosse Goal is also manufactured in several patterns, namely Classic, Round Yoke, Rectangular Yoke, Raglan, Raglan – Round Yoke. All patterns can be further adjusted. It is possible to carry out the adjustment in the form of double sleeves or shoulders, sewing ventilation and mini-ventilation mesh into the side part of the jersey and the like. We adjust color of the meshes as one of the few manufacturers in order to achieve perfect resulting jersey design. Naturally, you can choose the type of collar, fonts and numbers according to your wishes. We also have an option to choose the lower finish of the jersey in STANDARD or PRO style. The basic size of jerseys can be determined using the size tables. The best materials of jerseys are: CANADA 155 gr., CoMo 160 gr., LION 160 gr., KOSTKA 145 gr., BÁRA 145 gr., GOLF 205 gr. and O-Zone 170 gr. More information about materials can be found here. Information on the price can be found in the price list. The jersey pattern is manufactured in the form of classical or raglan – anatomically adapted to the female body. You can also choose from new, attractive adjusted patterns. Naturally, you can choose the type of collar, fonts and numbers according to your wishes. The basic jerseys size can be determined using size tables. 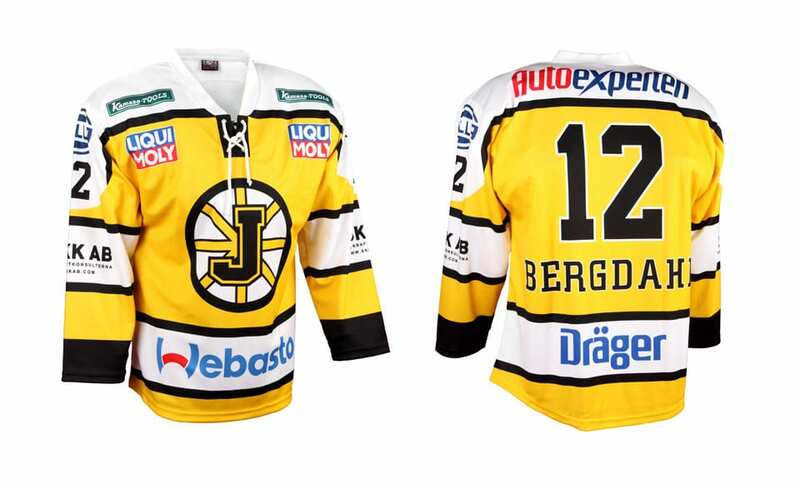 The best materials of jerseys are: CANADA 155 gr., CoMo 160 gr., LION 160 gr., KOSTKA 145 gr., BÁRA 145 gr., GOLF 205 gr. and O-Zone 170 gr. More information about materials can be found here. Information on the price can be found in the price list. Skirts for lacrosse are also very sought-after item. We produce them as a single color or in design according to the customer’s jersey and wish. Lacrosse skirts can also be manufactured with an inner underwear. The basic skirts size can be determined using size tables. The best materials of skirts are: CANADA 155 gr., CoMo 160 gr., LION 160 gr., KOSTKA 145 gr., BÁRA 145 gr., GOLF 205 gr. and O-Zone 170 gr. More information about materials can be found here. Information on the price can be found in the price list. Lacrosse shorts are manufactured in two pattern versions – for women and men. We produce them a single color or in design according to the customer’s jersey and wish. Special patterns of the shorts that guarantee maximum comfort are also matter of course. The best materials of jerseys are: CANADA 155 gr. and CANADA 210 gr. More information about materials can be found here. Základní velikosti lakrosových trenýrek si určete pomocí size tables. Information on the price can be found in the price list. Pokud si nevyberete žádný model dresu z naší nabídky, nebo požadujete lakrosové, box lakrosové nebo Lacrosse EU dresy v originálním designu,můžeme v našem grafickém studiu společně s vámi vytvořit dresy podle vašich představ. Příprava grafického návrhu je zdarma. Samostatná výroba dresů a trenýrek se vždy uskuteční až po odsouhlasení vzorků nebo tiskových náhledů. V případě ztráty nebo zničení vašich současných dresů vám rádi zkompletujeme neúplné sady zhotovením podobných dresů tak, abyste i nadále mohli tyto dresy používat.